Do these people in the south west not have a ruler? 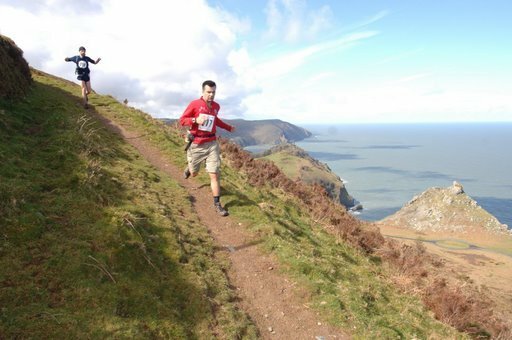 The Exmoor coastal marathon was possibly the most spectacular marathon I have yet run. I say probably because for much of it I had my head down in an attempt to stop my lungs from exploding. I get to that start of most races nowadays not quite sure how I am feeling. Back to back marathons are taking their toll and leaves me feeling flat at the start of a race. However that feeling soon subsides when the running start. Well, at least until the first hill, which was about 2 minutes into the race. I've gone into each race recently hurting from the last one. This was no different. After about half a mile there was a steep hill and lots of steps. About an 800ft ascent. I felt so much pain in my calves again (a part of my body that didn't trouble me till recently) as I went up a hill just half a mile into the race. All the time I keep thinking to myself that this is a good learning experience for me. 6 weeks time I'm going to be feeling worse than this and will still have further to go. I need to know how it feels to run long hard distances when my body feels so weak. Luckily it had stopped raining just as the race started which allowed us to look up and admire the beautiful view of the exmoor coast. I felt sorry for all those poor suckers who are running the Deptford circus the next day. The first "10k" measured suspiciously at 11.5k. I'm always in two minds when that happens. It's either annoying that I'm going to take longer to finish this that expected or I'm getting some value for money miles - free miles that I don't even have to pay for. For marathons is such settings these VFM miles are very welcome. Somehow i doubt that I'll feel the same if another mile was added to the GUCR. The route then went on a uphill (a theme here) stretch of road. There was a sign warning motorists about the 25% incline. No such warning for runners. I've become a wimp recently and walked a lot of hills. I often use the excuse that there are too many people in front of me in the way to run but I couldn't use the same excuse this time. The road was massive. Soon we were on the top of some cliffs looking at the coastal path. It wasn't as windy as the Jurassic coast which was good because it allowed me to keep my head up and look. Cameramen have a habit of hiding in secluded places (usually at the tops of hills) and taking awful photos of runners as they struggle up a hill. They are like snipers. However this one was different. They got some spectacular photos including this one that appeared in the race report in Runners World. The route followed coastal trails and roads and had about 5 very long inclines in total. It was by far the hardest marathon I've ever done but also the best looking. I ran alongside some randoms as usual including an older lady who could still run up the final hill that led into a hilltop town. I walked it and overtook some others trying to run it, there seemed no point in destroying my legs. I reached the last water station when my watch said 26 miles. I was a bit dehydrated though it was completely my own fault. I did not take enough with me and it was getting hot. Obviously a great thing about a race being long is that you get some extra miles for free. The bad side is that you never really know where you stand in terms of distance remaining. I didn't really worry though as it was such a nice race and a nice day. I finished in just over 5 hours and was surprised to find out that I'd come second in the series and won a rucksack. I can't think how I came second, I must have been one of about 4 runners to do the 3 races required. Another great race that was really hard but well worth the trek down to the end of the country for.